I wrote back: “Hello John, thank you very much for following my posts on Gomarbella, I appreciate it very much. I’ll email this reply and some photos to you also and please feel free to contact me anytime. I do like receiving questions through the blog though because my replies then become available to everyone. I’ll also dedicate this blog to you! 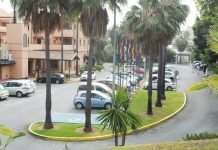 By chance this afternoon my wife and I picked up a friend from just behind Cala Azul apartments. 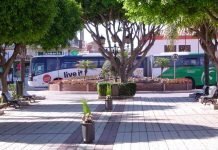 When we dropped her back in the late afternoon, I took some photos of the La Cala bus stops. 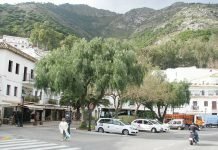 Travelling by bus from Fuengirola, stay on the bus while it loops through La Cala de Mijas town and then when it starts to climb up the ramp from the roundabout to rejoin the main A7 road heading towards Marbella, start to get your belongings together. The bus will swing back onto the road, pass under a pedestrian footbridge and then your bus stop is about 400 metres ahead. Ring the stop request bell as soon as you see Lidl supermarket up on your right and the green BP service station which you see in the photo on the other side of the road. The bus will hardly have gathered speed before it stops at the La Cala bus stop. 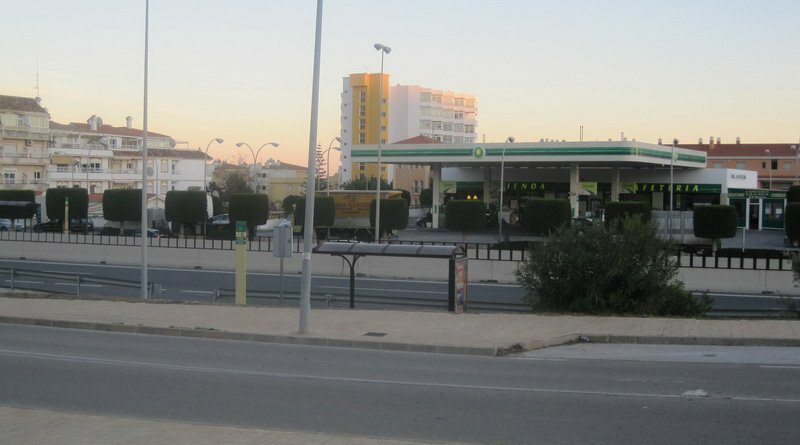 In the photo above you’ll see the bus stop shelter nearest the Cala Azul apartments on the near side of the road and the other La Cala bus stop next to the BP service station on the other side of the road. From where I was standing the Cala Azul apartments are just behind. In the distance looking back towards La Cala you’ll see the pedestrian road bridge that everyone uses to get from La Cala de Mijas town to the Saturday morning market just beyond the Lidl supermarket. 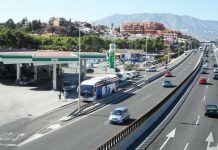 Follow the link to see the list of bus stops between Fuengirola and Marbella and you’ll see that the La Cala bus stop is the first stop after leaving La Cala de Mijas heading towards Marbella and the last stop before the bus goes into La Cala de Mijas on its way to Fuengirola.